So far we have looked at solely categorical data (Testing Ratios) and continuous data taken from members of different groups or categories (Testing Populations). Here, we will look at methods to test whether two or more samples of continuous data are positively or negatively associated. We will also consider having multiple predictor variables. Do the two continuous variables come from the same distribution? ks.test(). We assume no causal relationship between the continuous ‘predictor’ and the continuous ‘response’: correlation, cor(), cor.test(). We are testing if the continuous/categorical predictor variables are causing some of the variation in the continuous response data data from more than two groups and/or two predictors: linear regression, lm(). 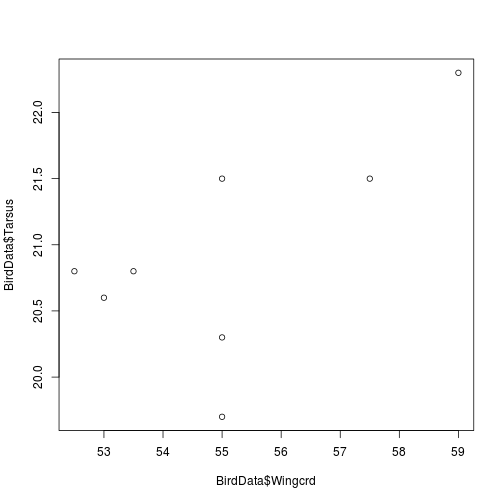 If we have continuous data on both sides, we will most likely make some kind of scatter plot. 1. Do the two continuous variables come from the same distribution? We can use a Kolmogorov-Smirnov Test to test whether two samples come from the same distribution. 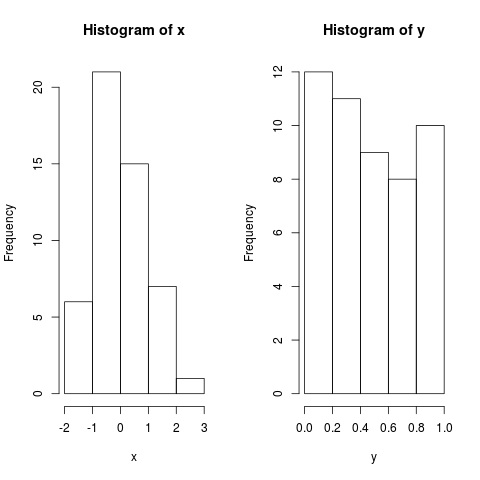 ks.test(x = , y = ) performs a two-sample test of the null hypothesis that x and y were drawn from the same continuous distribution. x = and y = are vectors of numeric data. Generate 50 values drawn randomly from two different distributions: x is from a normal distribution and y from a uniform. We can check this with histograms. The ks.test() function takes x = and y = . The p-value less than 0.001 suggests that x and y are indeed drawn from different distributions (as we shushpected … ). cor.test() tests for association—correlation—between paired samples. It returns the correlation coefficient and the p-value of the correlation. method = Pearson’s product moment correlation coefficient (method = 'pearson') is the parametric version used for normal data (and the default). Kendall’s tau (method = 'kendall') or Spearman’s rho (method = 'spearman') are used for non-parametric data. The three methods each estimate the association between paired samples and compute a test of the value being zero (indicating no association). The correlation coefficient can fall between -1 and 1. 1 means a strong positive correlation (x goes up and y goes up). 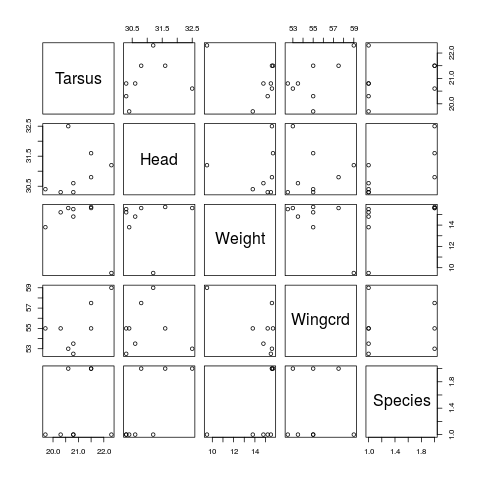 Let’s look at the small sparrow dataset, and the relationship between the various measurements. We can use the pairs() function to plot all the variables against one another. We have no a priori reason to believe that any of these measurements of sparrows drives variation in the others. However, we can test whether they are correlated. For example, do sparrows with larger heads also have larger wings? The function cor() returns the correlation coefficient of two variables. It requires an x and a y. Pearson’s product moment correlation coefficient is the parametric version used for normal data; Kendall’s tau or Spearman’s rho for non-parametric data. sample estimates cor 0.6409484 is the correlation coefficient. The p-value of the test is 0.0868, not less than the usual alpha of 0.05; so we cannot reject the null hypothesis that Tarsus and Wing are not significantly correlated. 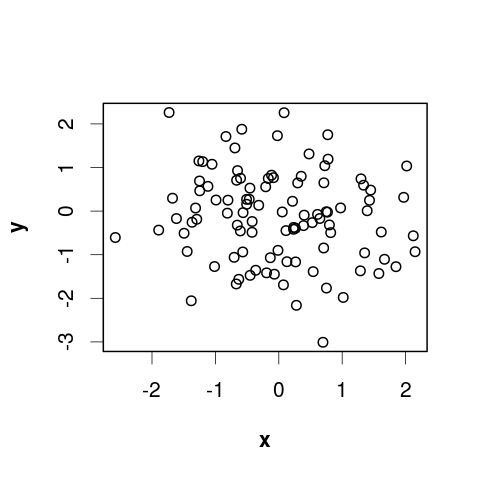 If we think that one variable is driving variation in the other, we should use regression rather than correlation. data = (optional) a data object, usually a data.frame. terms is a series of terms which specifies a linear predictor (or independent variable) for the response. The response variable is fitted as a function of the predictor variable. The tilde symbol ( ~ ) signifies as a function of, and separates the response and predictor variables. Adding further predictor variables to the right hand side is possible (see Formulae). lm() provides estimates of the intercept, slope and sd. We will illustrate the use of lm() using the sparrow data (even though we know there is no causality here). First, we plot the data. Second, we run the model. We can specify the formula, with or without the data = argument. The output of lm() is a list. We can use str() to examine the elements of the output, as well as pull out various parts directly, or use other functions to do so. For example, summary() pulls out various elements and formats them nicely to display the whole model table. ## Wingcrd       0.2328     0.1138   2.045   0.0868 . Coefficients: For continuous predictors The Estimate and Standard Error for the intercept and slope. It also includes the t-values and associated p-values testing if the estimates are significantly different from 0. F statistic From the ANOVA table of the model. p-value: The probability of obtaining a result equal to or more extreme than what was actually observed, if the null hypothesis is true. The null hypothesis is rejected if the p-value is less than the alpha (usually 0.05). More. We can use abline() to add the fitted line of the model to a plot of the raw data. You can also include categorical predictors in linear models. If we include only one predictor, and that predictor is categorical, we could think of this as an ANOVA (remember that ANOVA and regression are essentially the same kind of thing in many cases). Let’s model Tarsus as a function of Species. A good plot of this model would be a boxplot. Now we can run the model. Notice that we can use lm() to run this model (whereas in Unit 3 we used aov()). And look at the summary. We have the same parts to the model summary as above, but the interpretation of the coefficient estimates is slightly different. 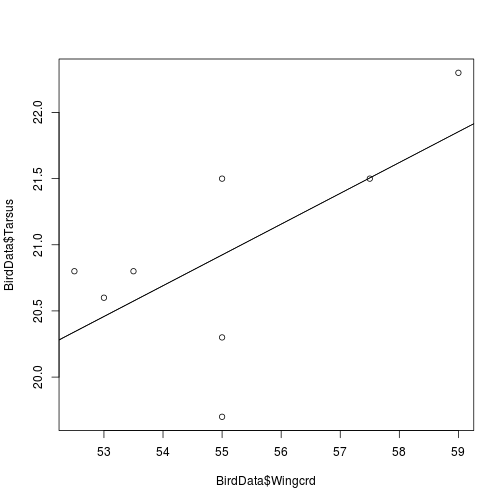 Coefficients: For categorical predictors the default is to display the mean of the base level (in this case Species A), and then the difference between the mean of each level and the base level. 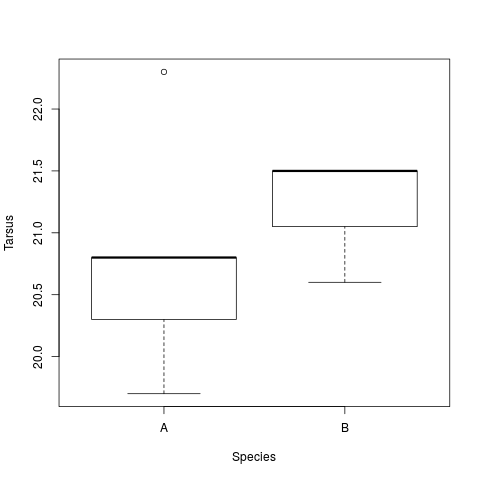 So, here we have the difference between the mean Tarsus size of Species B from Species A. It also includes the t-values and associated p-values testing if the estimates of this difference are significantly different from 0.